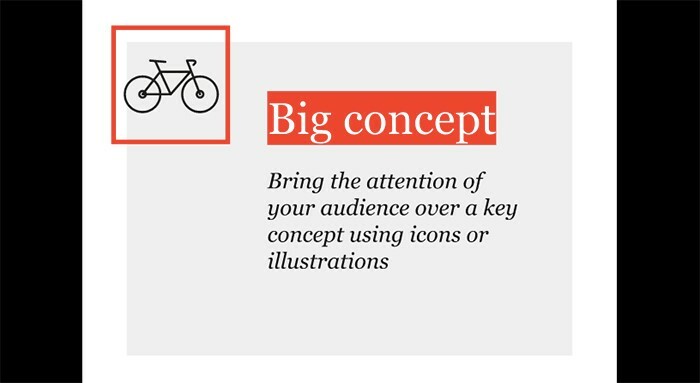 A presentation can help you to illustrate your message better to the audience. 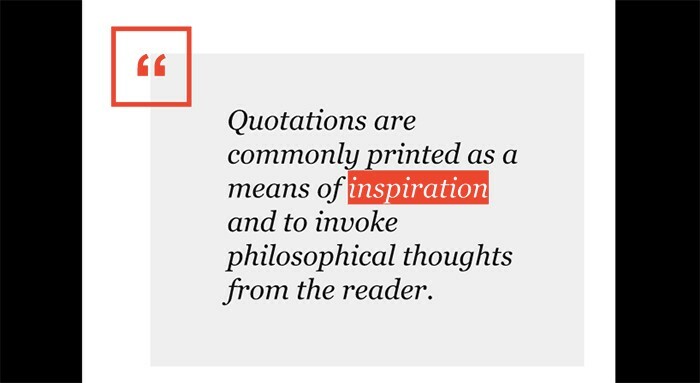 You can share quotes, complex data, maps, diagrams, and numbers in the more convenient way. 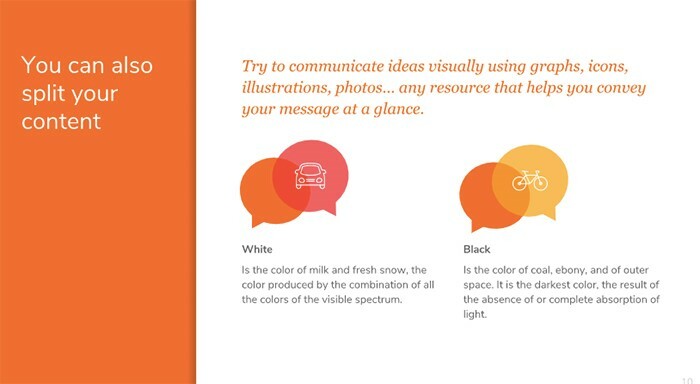 Obviously, visuals can help your audience better understand and remember information. 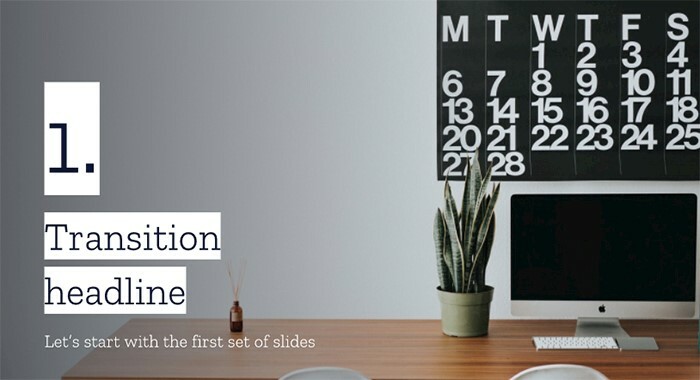 In this list, we have collected 35 best free Google Slides themes. 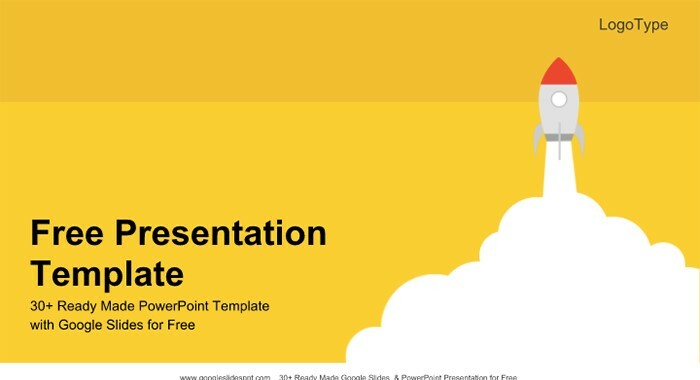 Google Slides presentation templates are more compatible then Microsoft PowerPoint. 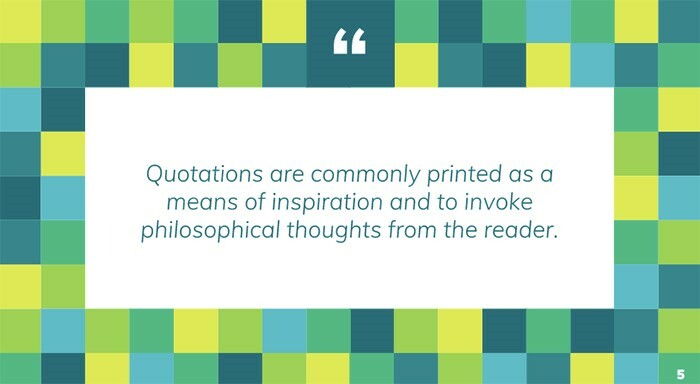 You can export different text files and PDFs quickly for your presentation. 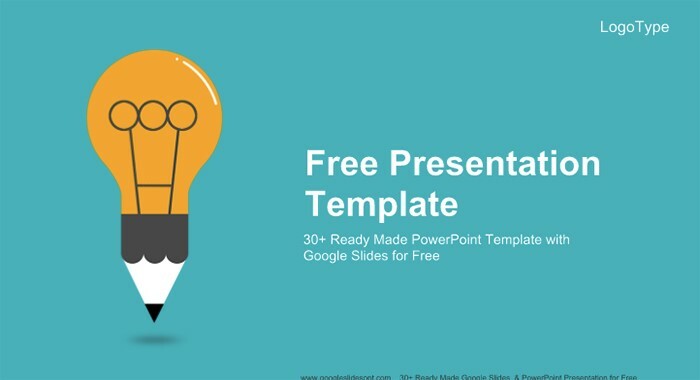 Besides, if you need to share your presentation on the web, you can do it fast and easy with Google Slides. 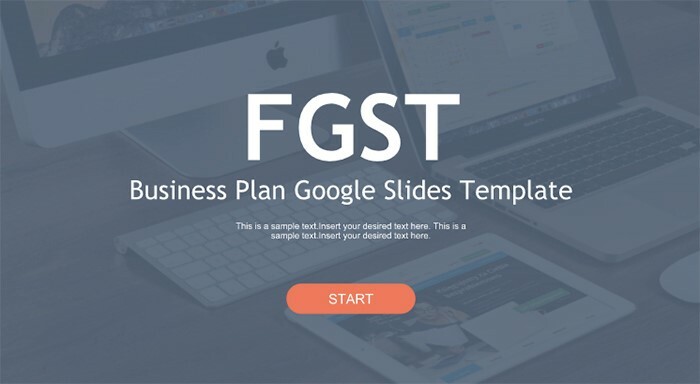 If you want to use one of these wonderful Google presentation themes from this collection, just make a copy to your Google Drive. Also, if you have saved your presentation file, you can open and edit it anytime you want. 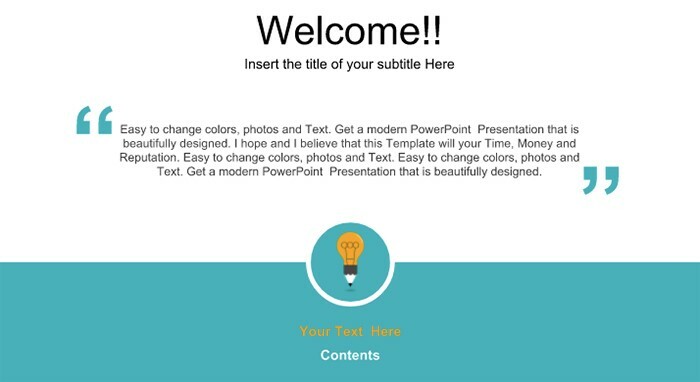 Google Slides is an online presentation site, that helps you create presentations. 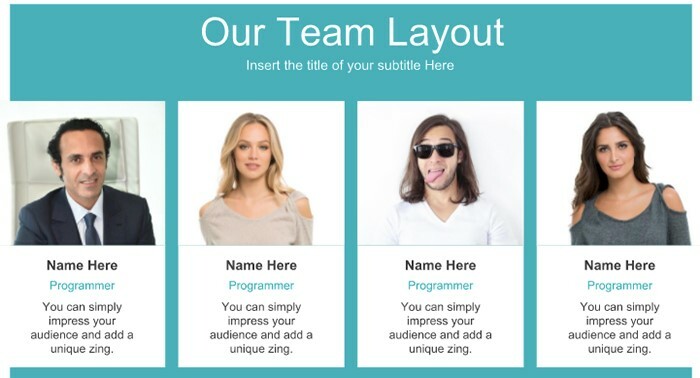 This online presentation site is perfect if you are working on a project with multiple people since you can share the presentation document and everyone can edit it, and see what each person is doing. Since this is an online presentation site, you can open it up on any computer, as long as you have internet. 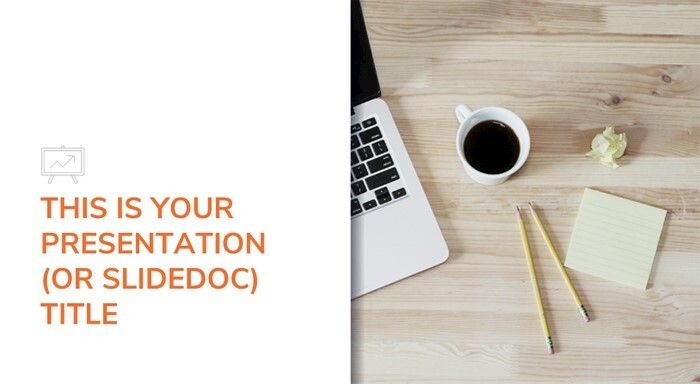 Unlike when you use other presentations, you have to try to download and save it in a format that is suitable for the device you’ll be presenting on. Not Google Slides. As long as you have internet, you should have no problem downloading your presentation, and you can always export it and download if you want. There is so much that Google provides for free. Google slides is perfect for students, teachers, and anyone who needs to create a presentation. Students are known to use it the most, especially when working in a collaborative presentation with multiple people. Google Slides is completely free, offers up to 15 GB of free storage so you can create as many presentations as you want and need. Another reason students use it the most is that it is simple and ready for you to edit and use. 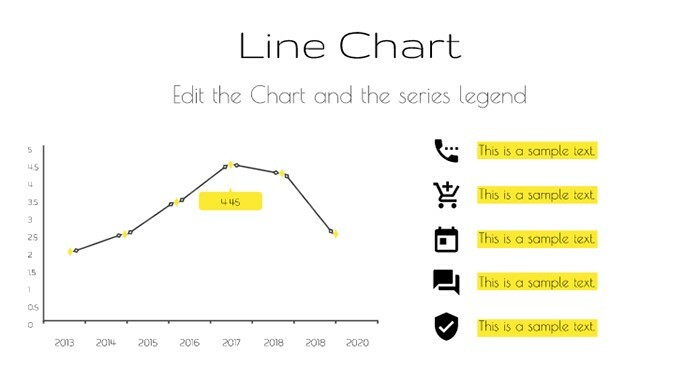 What makes Google Slides perfect is that, unlike other presentations makers, Google Slides automatically saves your work with every change so there is no risk to lose your work. Why should you use Google Slides? 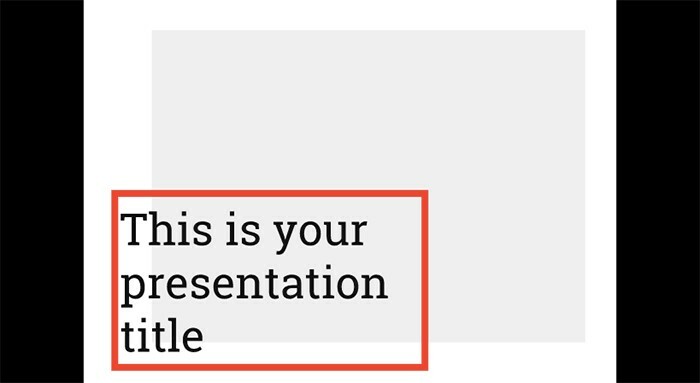 Well, Google Slides offers so much for you to use and to create the perfect presentation template. 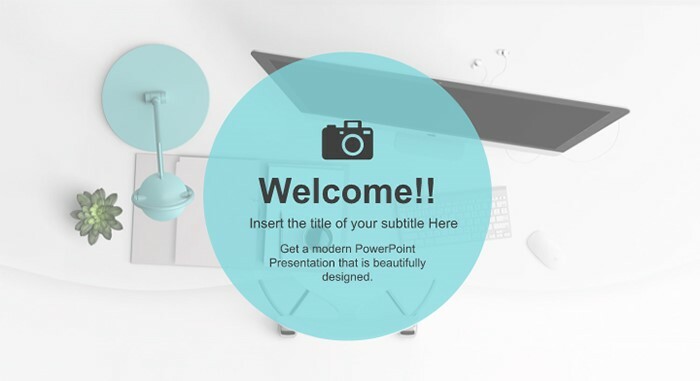 With the gorgeous and creative templates that are offered, you can create the best presentation for any theme and topic. 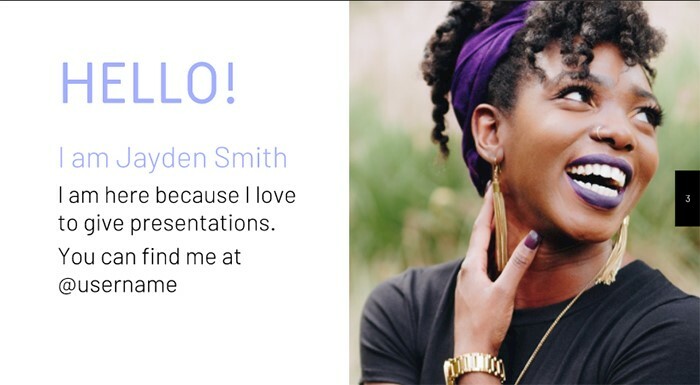 As a matter of fact, all the slides are well designed to use two fonts and create color palettes that will make each and every slide stand out. 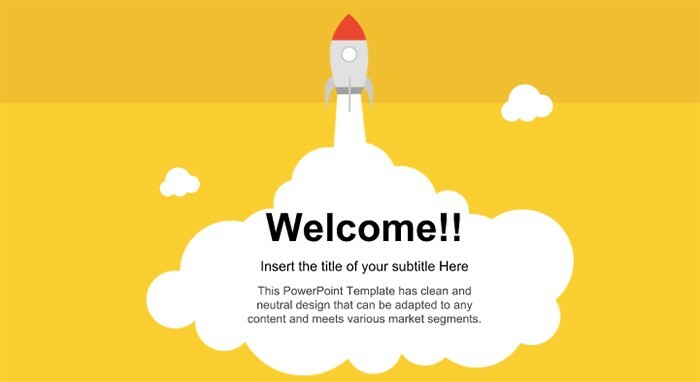 Don’t struggle with other presentation sites, or pay to create a presentation that is well designed, when Google Slides will help you stand out and give your audience a unique and clear message. 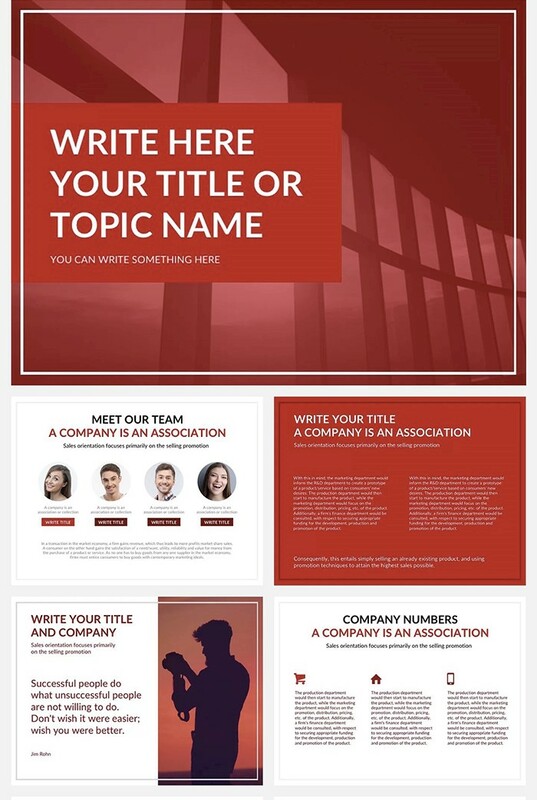 This presentation template for Google Slides has a bold red design and is crafted for corporate purposes. You can easily edit it online and insert all the necessary information. 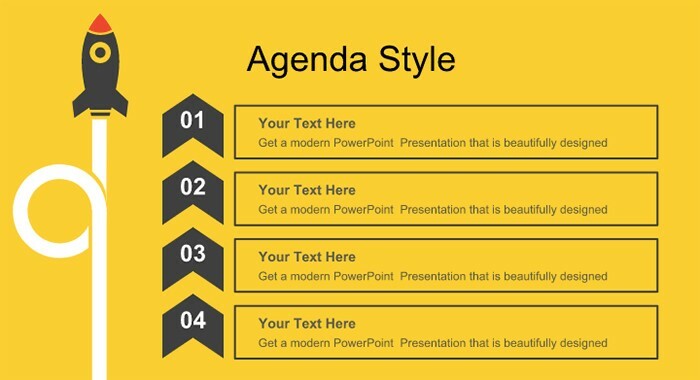 Modern presentation with strong typography and 16 useful editable slides. 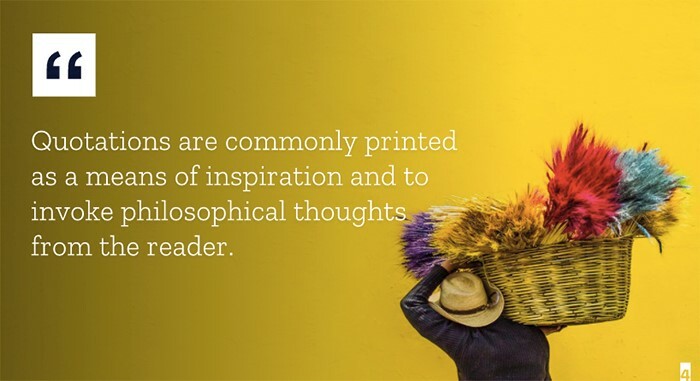 It’s a perfect theme to frame your ideas into a consistent message. 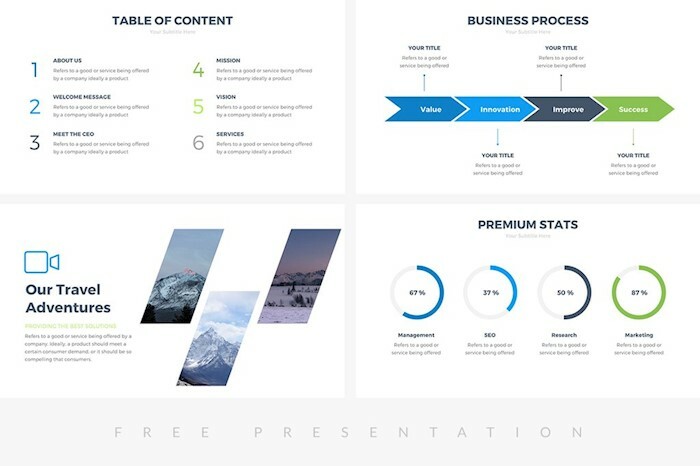 This professionally crafted yet free presentation theme looks like it took a lot of work to create it. In fact, all you need to do is add it to Google Slides and insert all the required data into the slides. 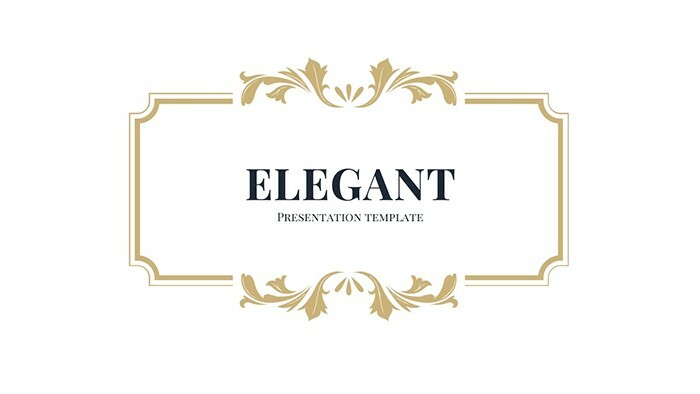 The vintage gold frame on the slides makes this theme elegant and sophisticated. It has slides with quotes, headlines, background images, text columns, and world map. 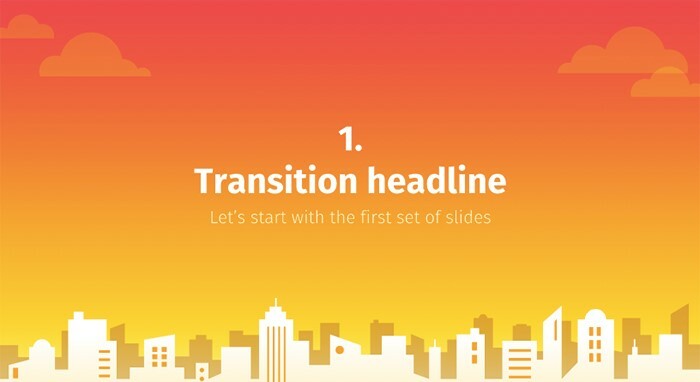 This Google Slides theme is using an illustration of a city skyline on each slide. It will be suitable for a big marketing project or some reconstruction ideas. 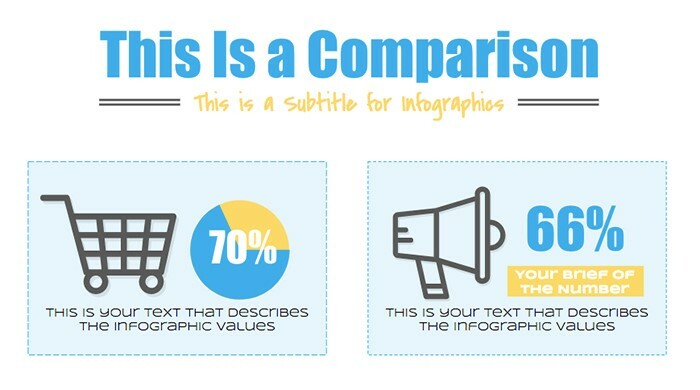 If you want to share complicated information easily, this presentation is the best way to do it. 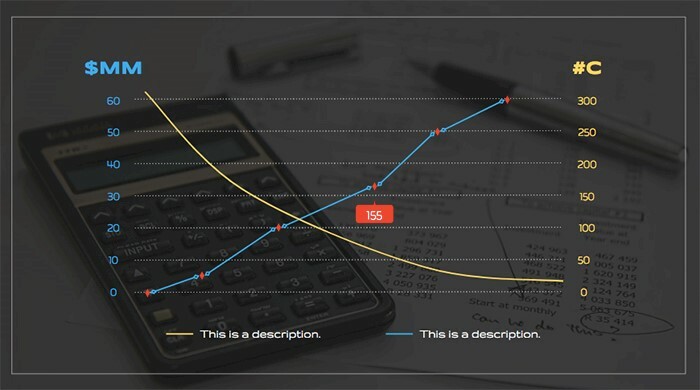 Graphs, charts, and timelines will help you to present big data in a simple form. 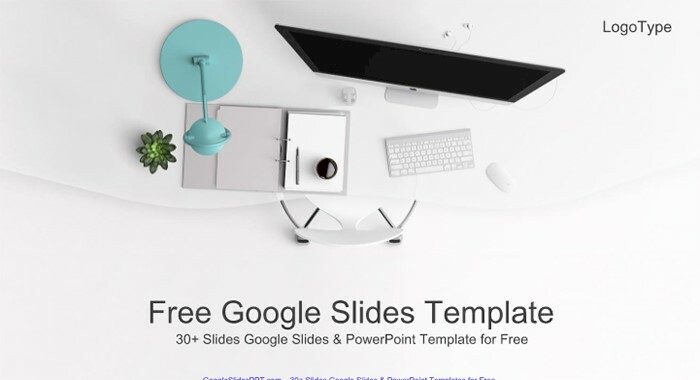 Check out this fantastic free Google Slides theme with 15 slides for compelling a list of any kind. To edit this template, you need to open it in Google Slides, go to File and Make a Copy. 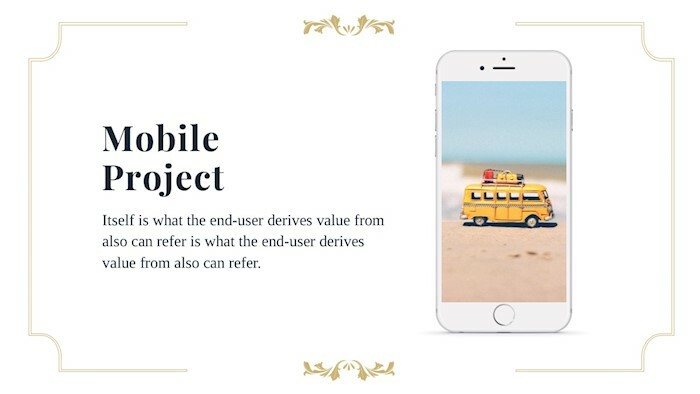 Here is a multipurpose presentation theme with 25 clean and professional slides. In just one click you can change colors, forms, shapes, fonts, icons, and backgrounds. 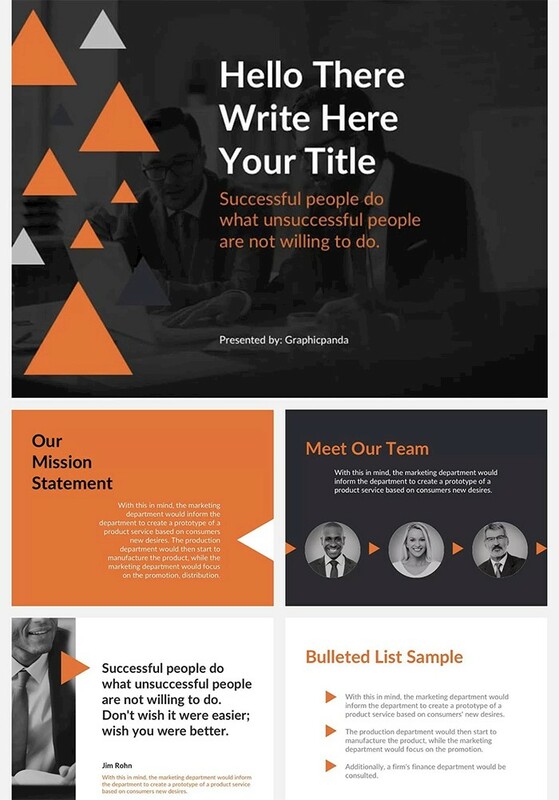 This presentation template uses black, orange, and white color scheme. It was crafted for business, marketing, corporate presentations. 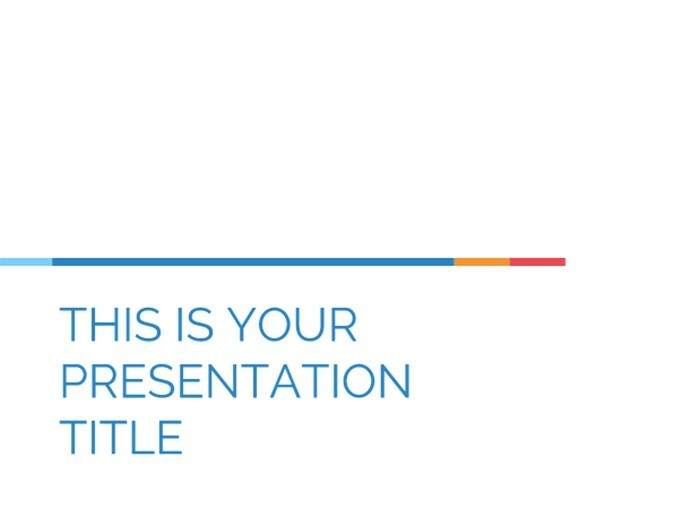 Here is a primary flat presentation theme which can be used for any topic or industry. There is no need to login or register a profile to use this template, just add it to your Google Drive and use. 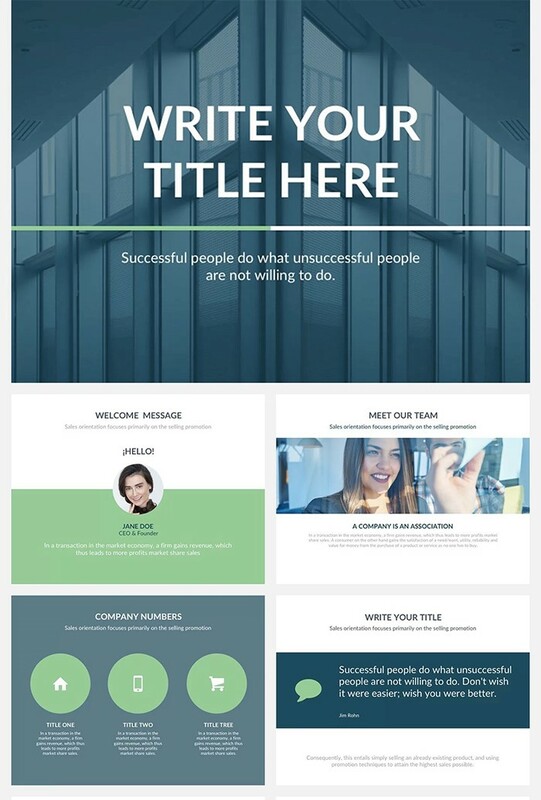 Do you want to impress your audience with your content rather than with graphic design of your presentation, then this templates is made for you. 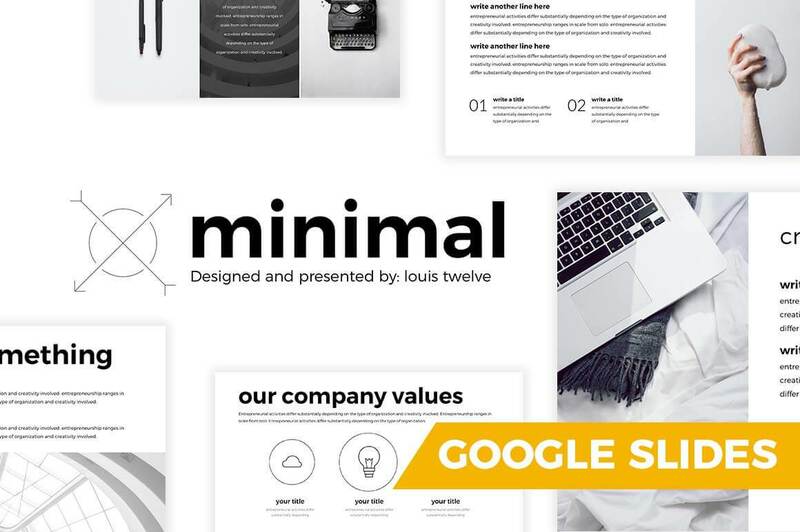 It features a clean, minimalist design for Google Slides which will make your content shine. 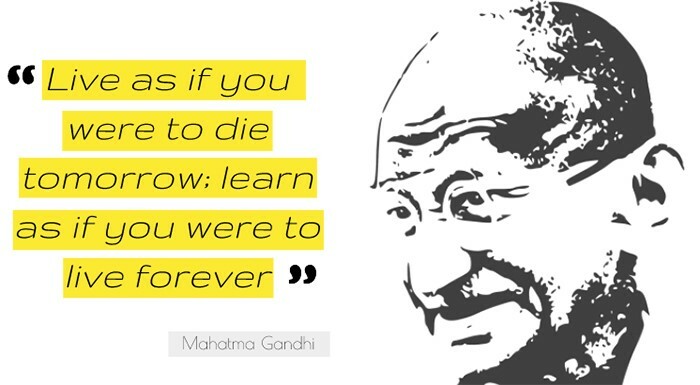 This education presentation theme for Google Slides has a yellow idea bulb on every slide. 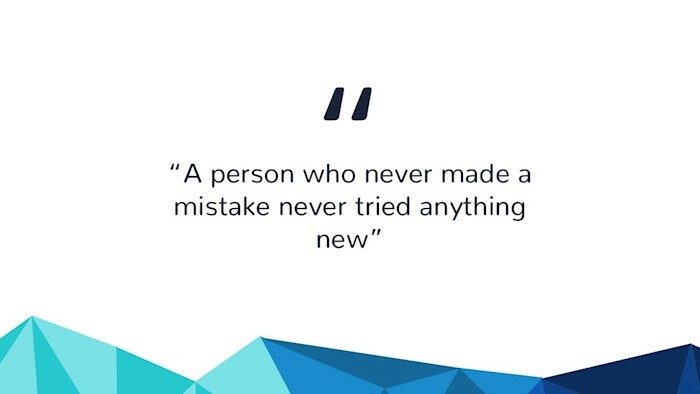 This means it will be a good choice when it comes to presenting new innovative ideas to a big audience. It has 34 different slides for any information. 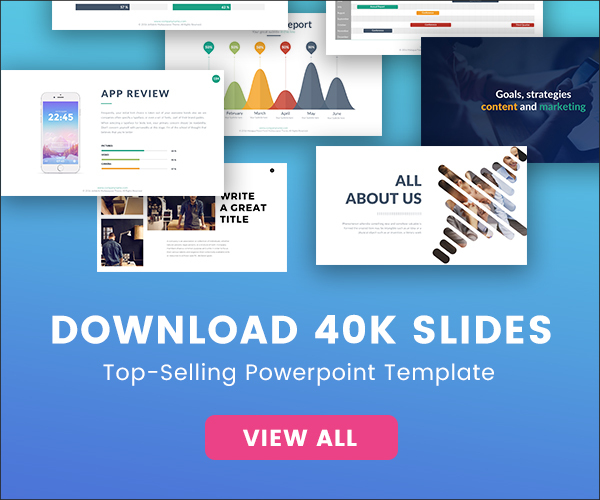 This is a nice free corporate presentation theme for Google Slides with eight unique slides. 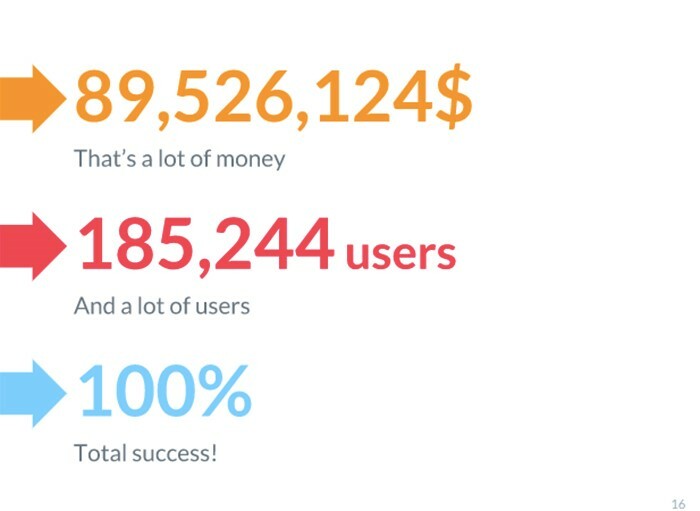 You can share stats, business process, what you do, and history with your audience using the pre-made slides. 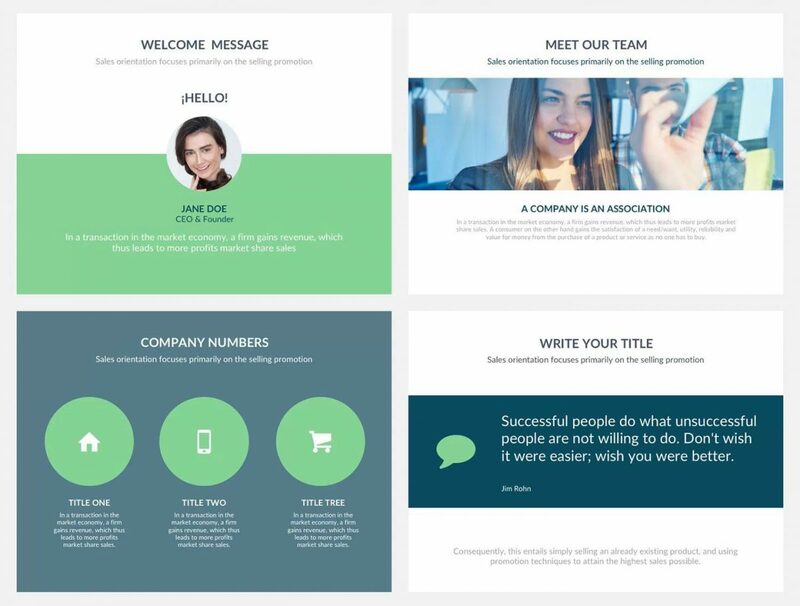 Launch is a modern Google Slides presentation template with 34 editable slides. They are yellow and are designed in the same style. You can edit anything you want from colors to shapes. 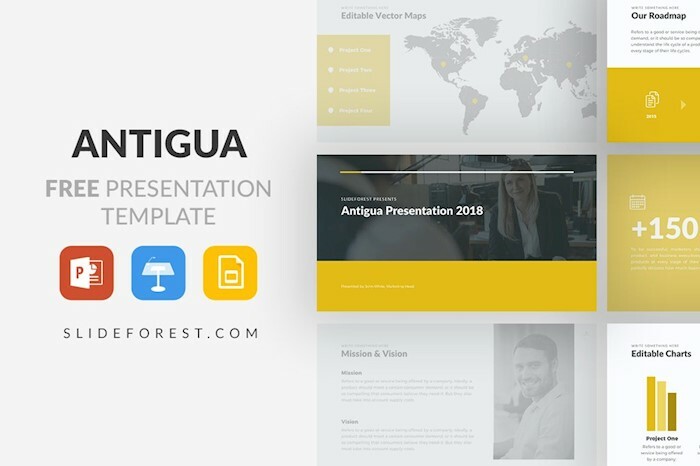 Check out Antigua which is a free business presentation theme designed in yellow and black color scheme. You can adjust the design of any slide for your needs using Google Slides online and then save it to your Google Drive. Would you like to impress your viewers with significant photo background? 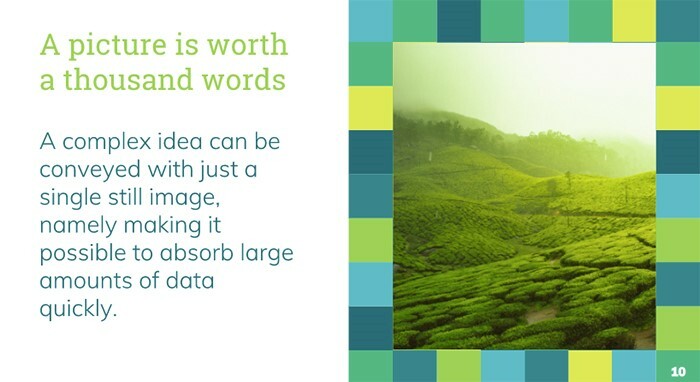 This presentation has pre-made slides with a big image on the backdrop. 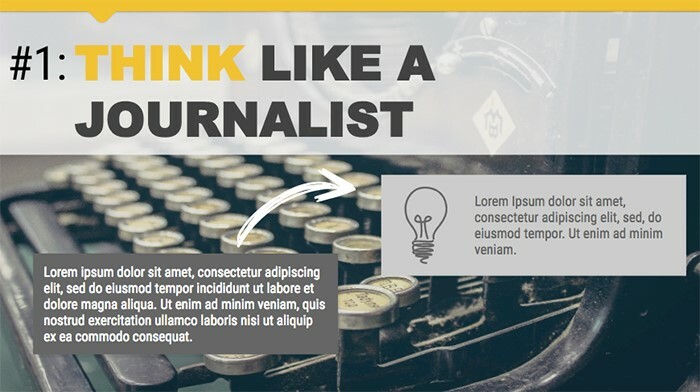 You can edit text, styles, fonts, and photos. 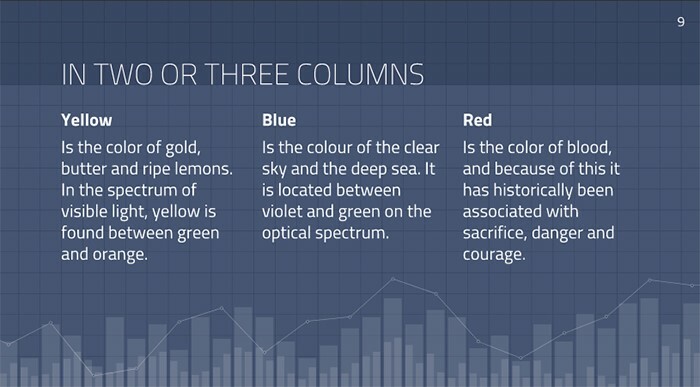 Here is a creative, bold Google Slides theme with yellow, green, and blue squares. 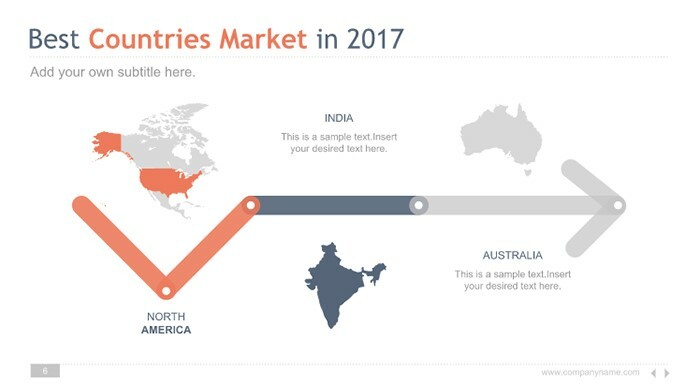 It features slides examples with diagrams, Powerpoint timelines, numbers, maps, and even device mockups. 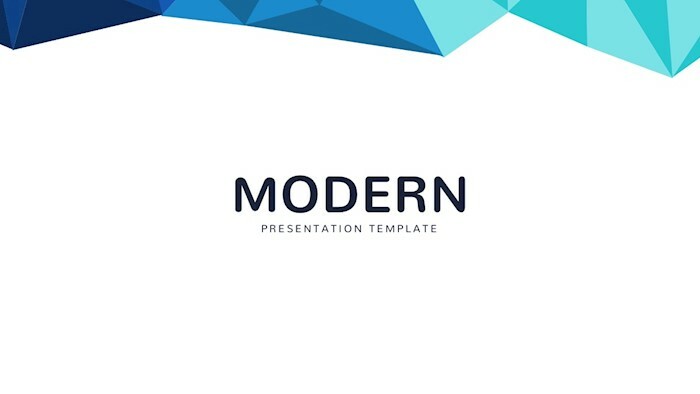 Tell about your company, ideas, strategies with this office presentation template. 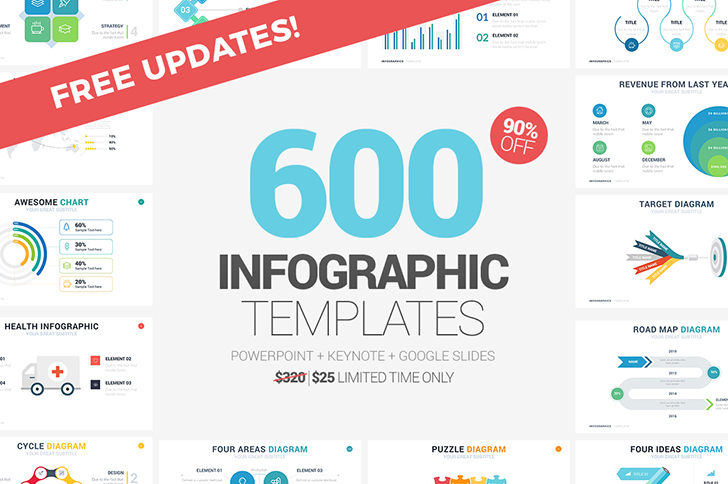 It includes 34 simple corporate related slides with portfolio, tables, infographics, maps, and charts. 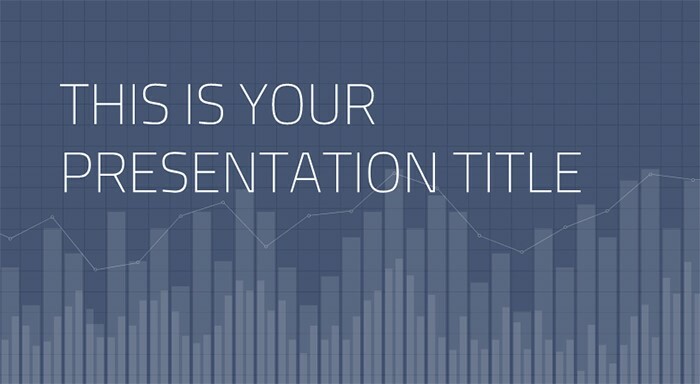 Save your time and efforts on developing a presentation with this template. 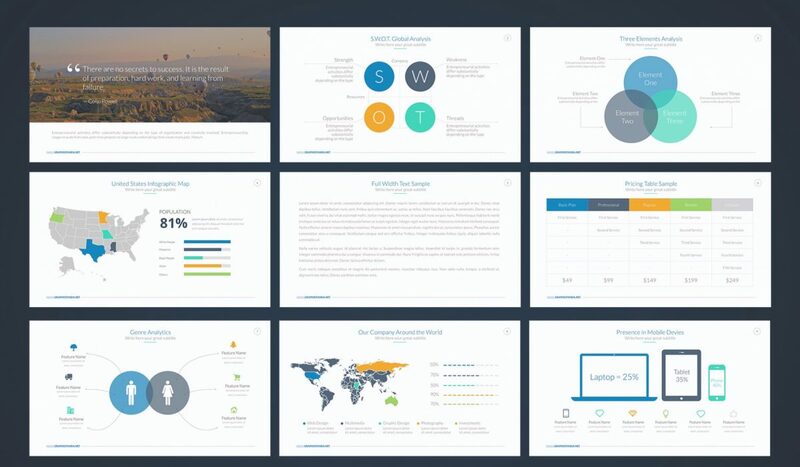 Alpha is designed in simple yet modern style with ten slides. You can drag and drop different shapes and objects to edit what you want. 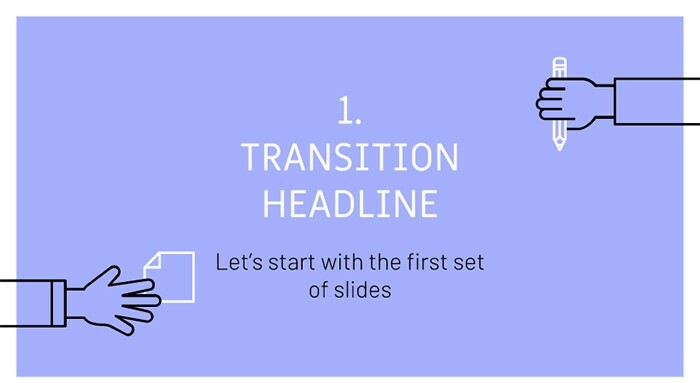 Get 23 clean fully editable slides for your next presentation. It has fun facts, process, team, numbers, map, and iPhone mockup slides. 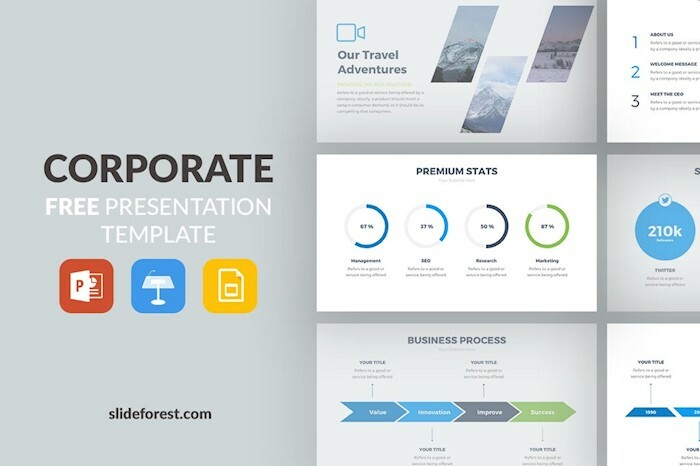 Here is a business plan presentation template suitable for charts, marketing messages and strategies, and other corporate purposes. 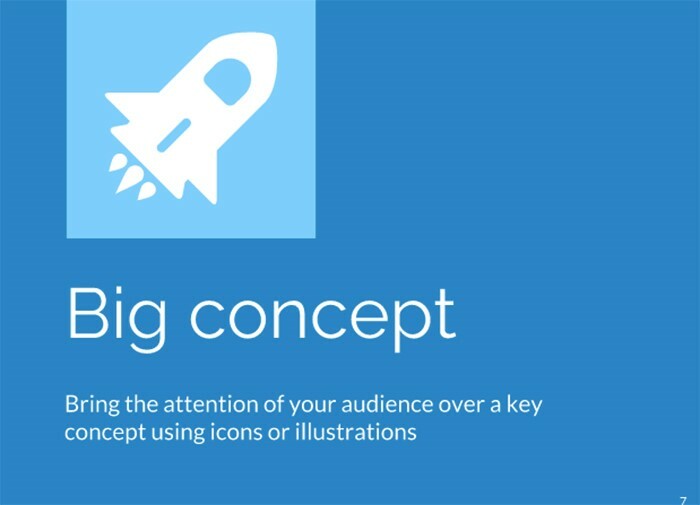 Make a copy to start editing the presentation theme. Ulysses presentation theme for Google Slides with an orange and white design is suitable for any kind of project. There are 28 unique editable slides in the theme. It also has customizable vector icons. 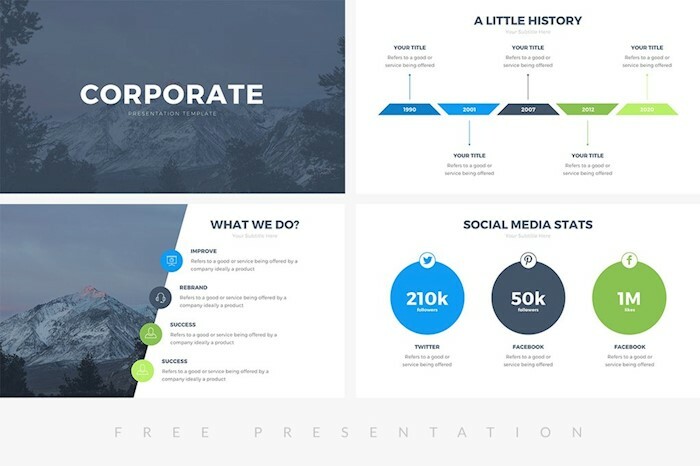 This Formal free theme for Google Slides will help you to create a corporate business presentation for your next performance. Use the structure and slide examples if you are making a presentation for the first time. 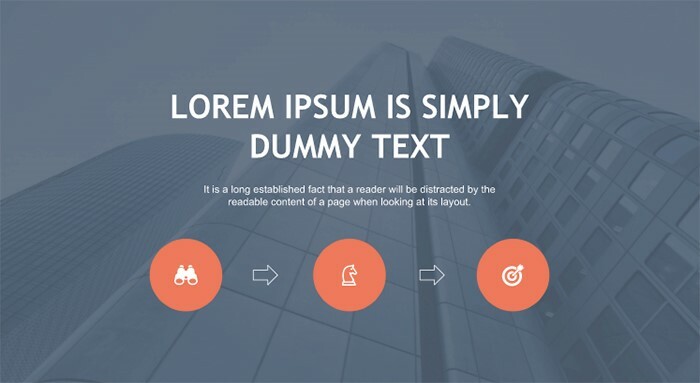 Here is a simple basic presentation theme with 25 different slides which are suitable for any kind of business. Red text and shapes on black and white background will help you to highlight specific information and focus viewers’ attention. 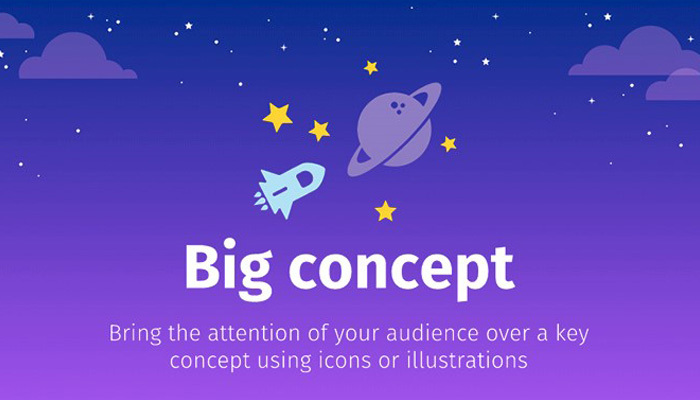 Antonio is a modern dynamic presentation theme with 25 customizable slides. With bold and straightforward typography and blue color palette, this presentation can be used for almost any type of industry. Ceres is a unique and creatively drawn design of flowers and leaves. 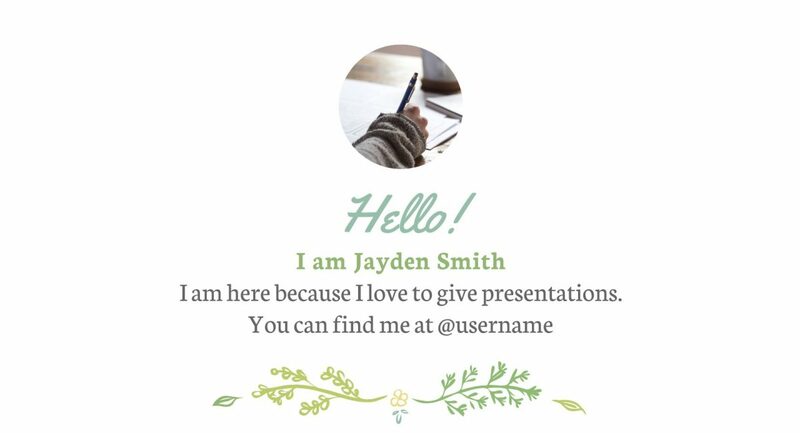 This theme has an earthy green color that gives this presentation a natural and fresh look. 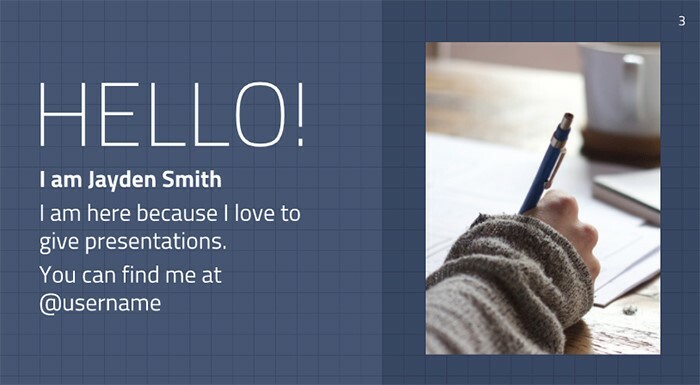 The Yellowtail and Neuton fonts used for this presentation give each and every slide a clean and organized look. 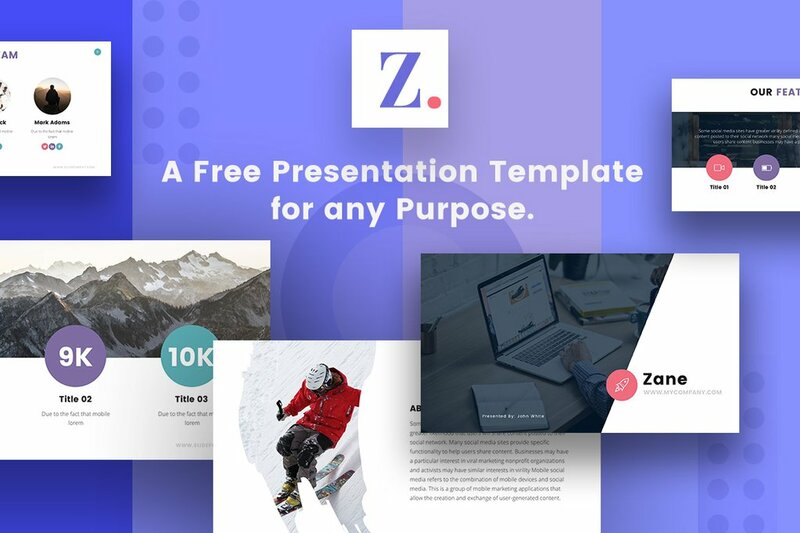 Zane is colorful and professional presentation template. 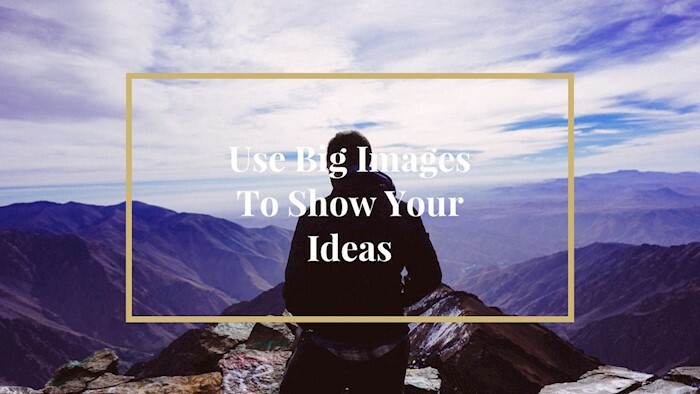 This template will impress your audience with its clean and professional look. 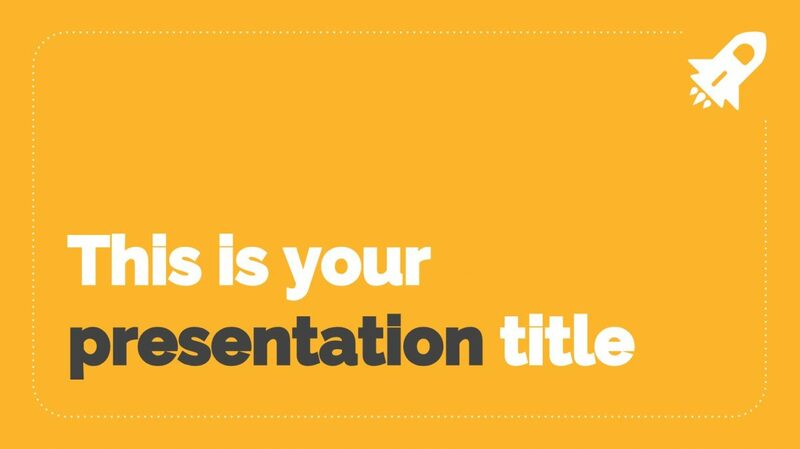 Using this presentation template, you will give your audience a clear understanding of what you are presenting. Are you tired of boring presentations? 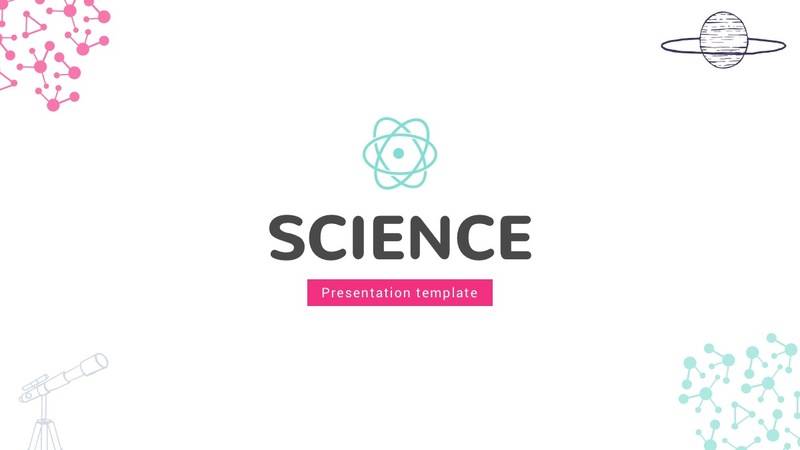 Then use the Science Google Slides Theme presentation template to present to your audience. 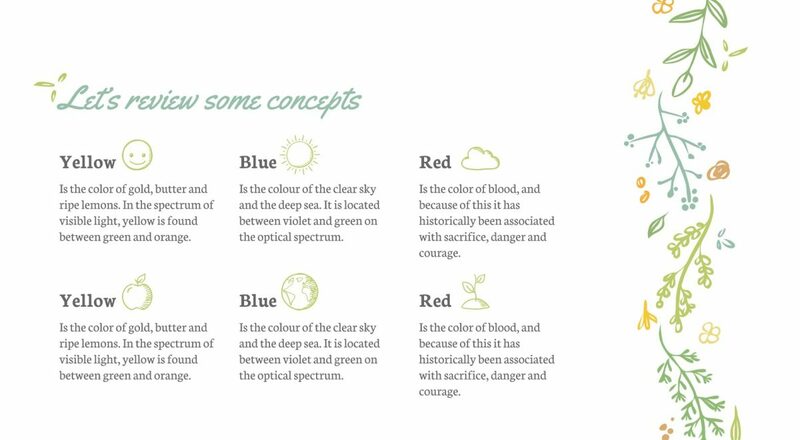 This fun and creative presentation template will make your information stand out with the creative designs and nice colors. 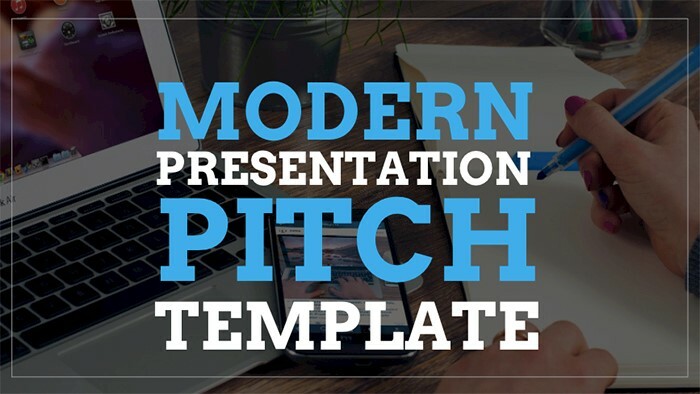 Choosing the perfect presentation template can be difficult considering all the different amount of presentation templates that are out there. 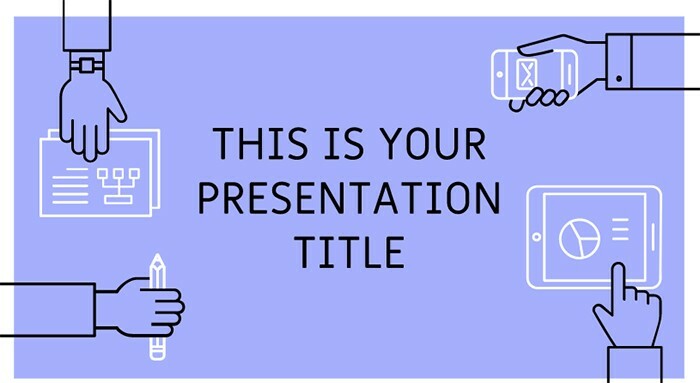 Alpha Presentation Template is the perfect presentation template is you want to execute a presentation that will express your creativity, yet give an organized and professional look. 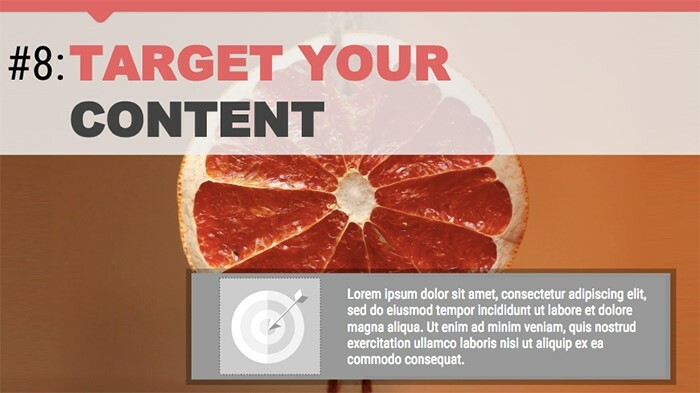 Orange is such a bright and eye-catching presentation template, that will help you information stand out. 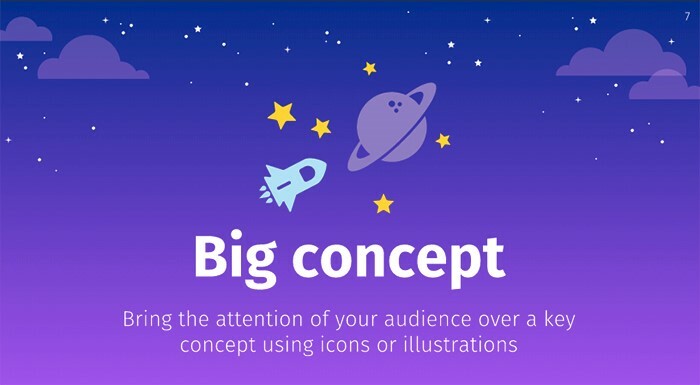 In addition, you can use charts, icons, maps, and tables, to make your presentation more visually appealing and helps the audience get a clear understanding of what you are discussing. 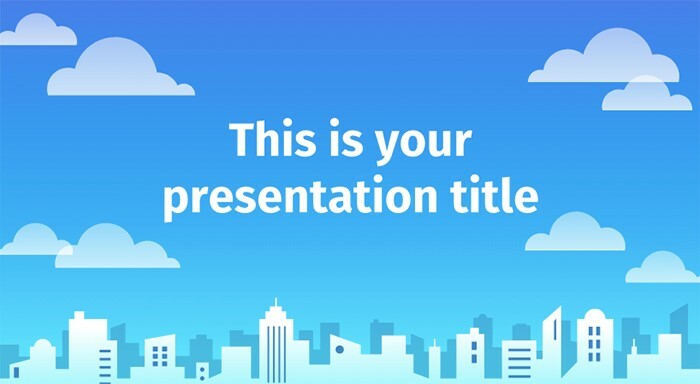 Getting down to business may not always be interesting, which is why we someone designed a presentation template that is well designed and very creative. 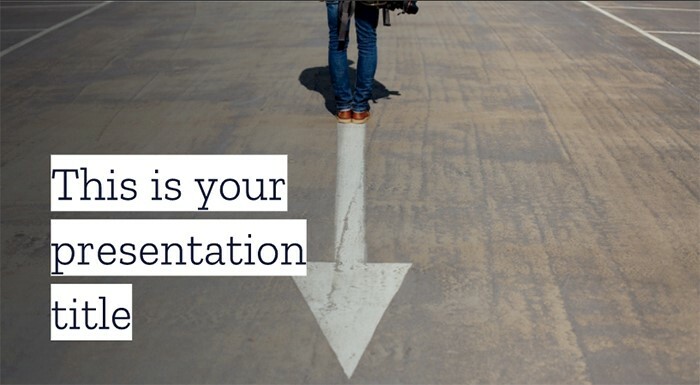 You have just about everything you would need to create an effective presentation. Are you looking for a classy presentation? 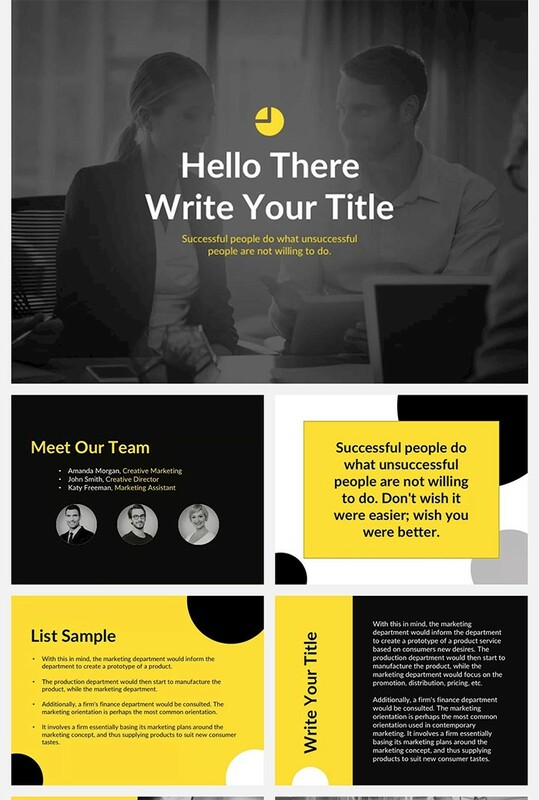 Then look no further, the Elegant Presentation Template that uses a different type of color scheme that isn’t boring and gives you a professional look. 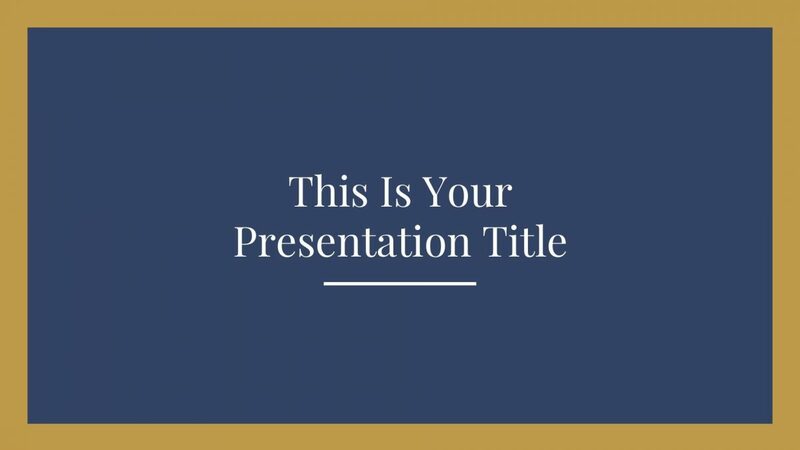 Even though this presentation template is professional, each slide bursts into color making each slide pop and you information standout. 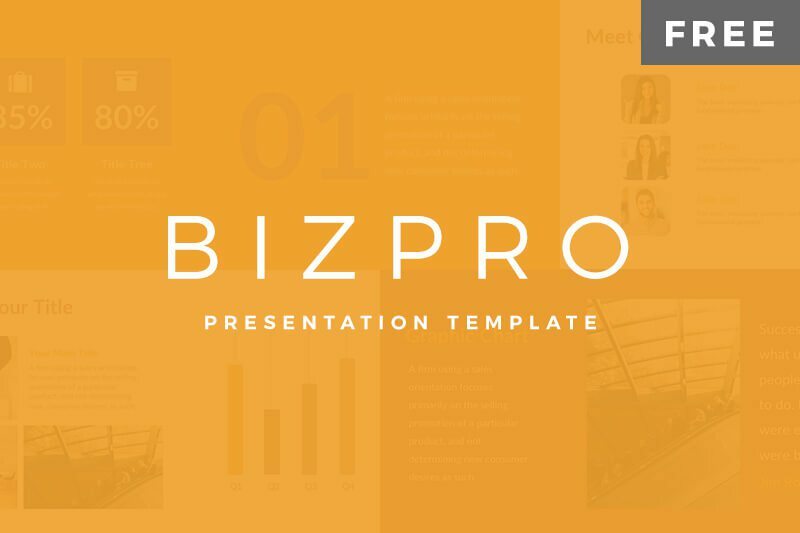 BizPro is a creative and fully customizable presentation template that is clean and organized with a professional finish. 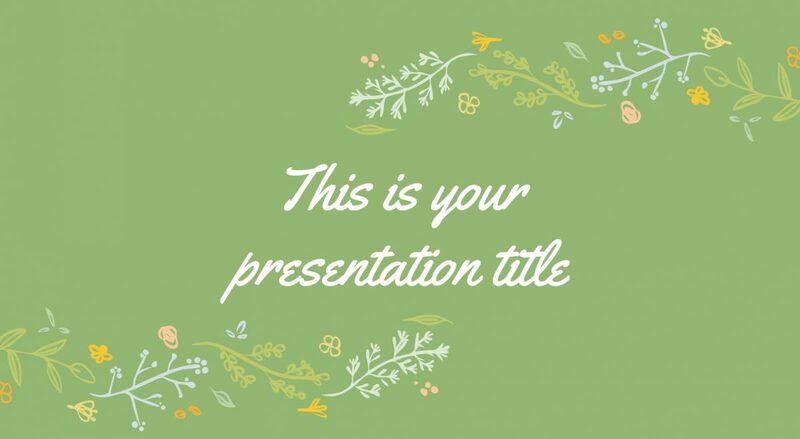 This template uses warm colors to give a soothing and calm feel to the presentation. If you do not like the colors used, you can customize it and create your own one of kind presentation. 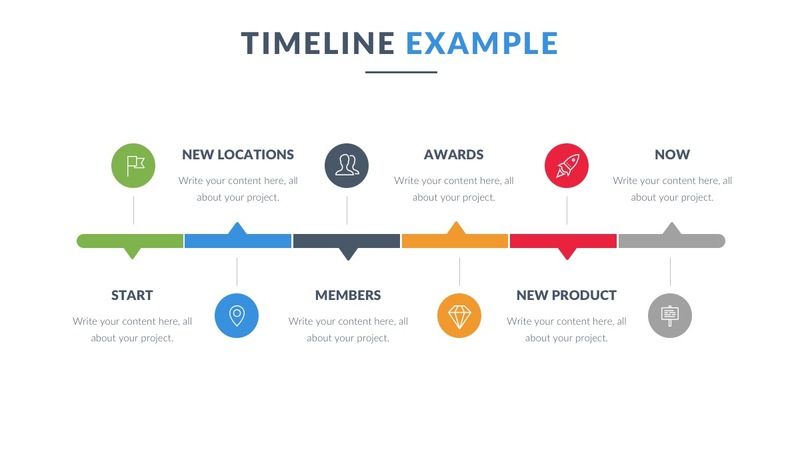 Timelines are great visual representations of time and to mention plans. In business, plans are important because its what keeps the business organized, and stated what needs to happen for the business to achieve their goals and plans. 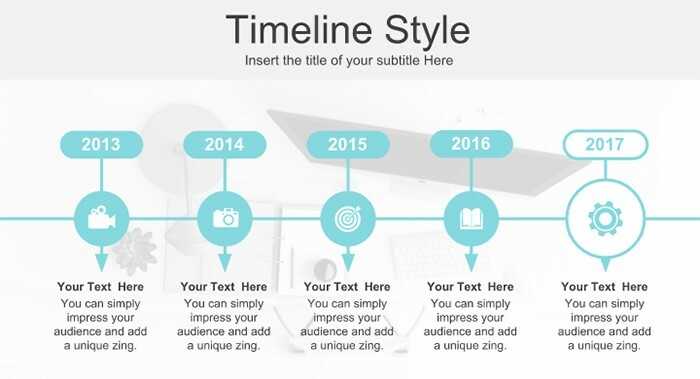 With this template, you are provided with 5 different timelines to edit and create your own. 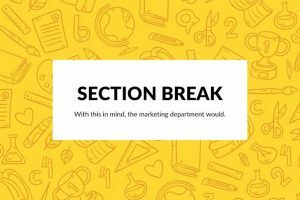 Where to find Google Slides? 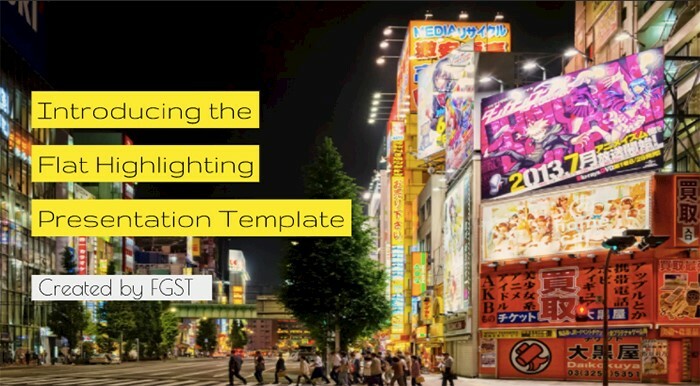 Looking for more Google Slides Theme presentations? 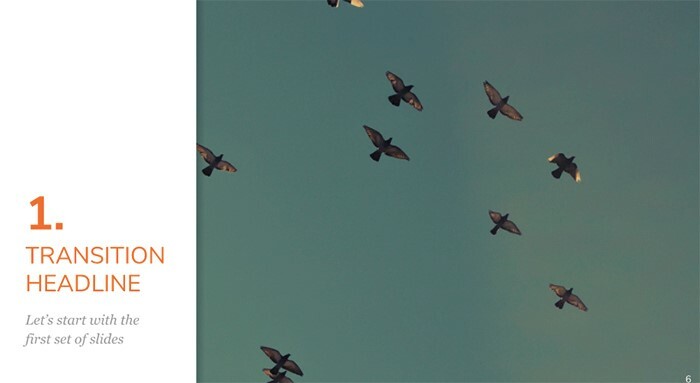 We have provided for you 5 of the best websites where you can look at different presentation themes and download them. Some of them are free, other websites you have to pay to use the presentation templates. For a website where you can find a variety of layouts an unique designs, then Slide Smach is the website you want to go visit. 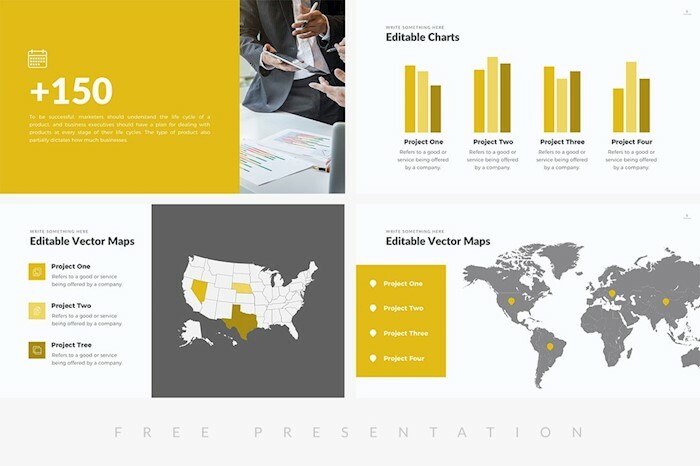 Here you will find everything you would need from minimal and simple presentation templates to fun and creative presentations. 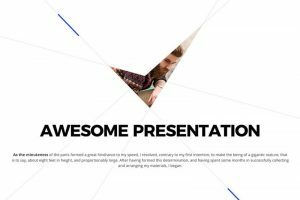 If you are looking for a wide range of presentation, then this website will provide for you a vast amount of presentation templates for you to choose from. 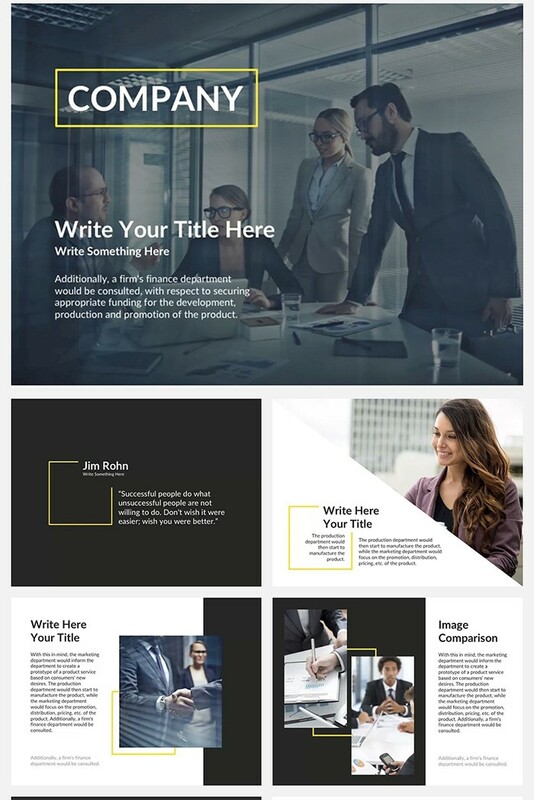 Choosing a presentation template has never been easier, all you have to do is visit the website and use their search function to find what you need. Slides Carnival is an organized and categorized website where you can find all different presentation types. 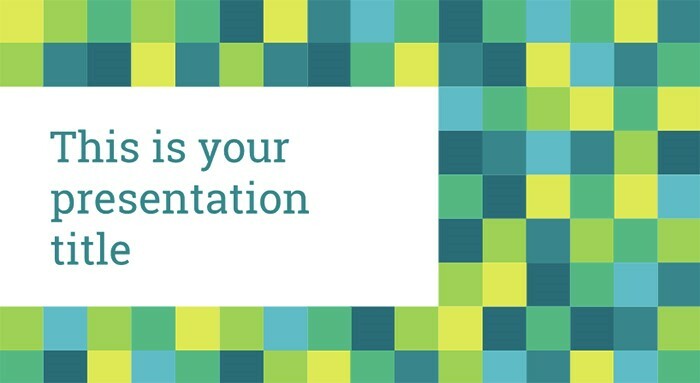 You can find just about any presentation for any theme that you may need. Whether you are presenting for commercial or personal reasons, you can find anything you’ll need here. 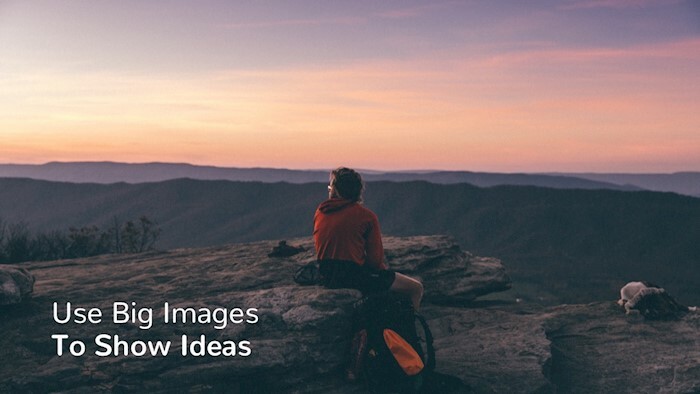 Hislide is an organized slide presentation website, where you could also find just about anything needed in other to make a presentation to make you stand out! You will find libraries with complex diagrams, and you can get the premium templates for just $20 a month. In Creative Market, you can find a variety of templates at different prices. 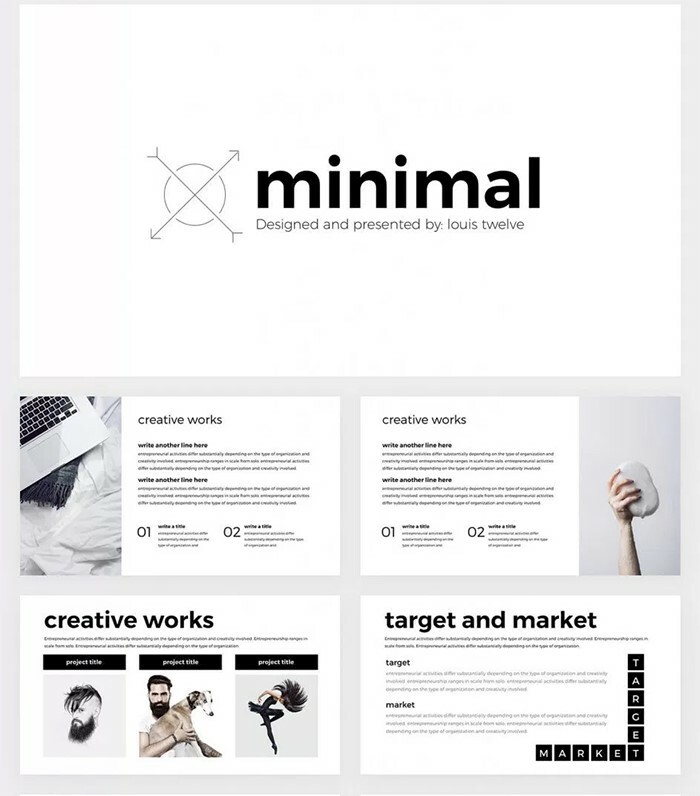 When visiting the Creative Market website, you will be provided with more than 500 presentation templates, all different and unique. How do you use Google Slides? Since Google Slides is a free website, a lot of features that are on Powerpoint, for example, you won’t be able to find every single one. But, your presentation can still be amazing and you can do other things to get around them. 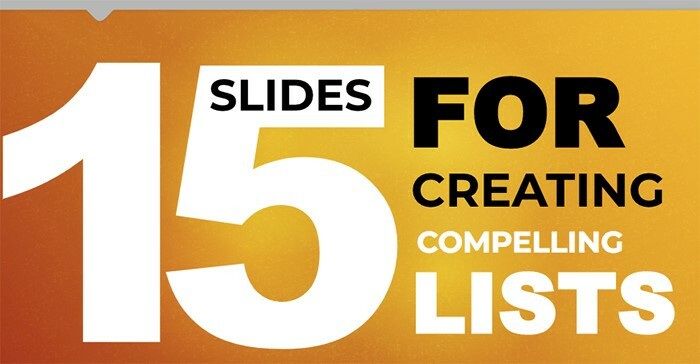 Here are some cool videos for you to create an amazing presentation. 4. How To Use Google Slides To Create Interactive Diagrams In Less Than 5 Minutes!